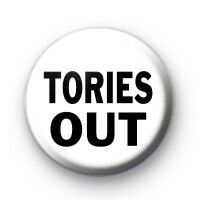 This is a black and white political themed pin badge with the BOLD text TORIES OUT! Theresa May and her conservative Government have failed the people of Britain & need to step down. We need a Party that will fight to save the NHS, End Austerity and support the people who need it most. We need Jeremy Corbyn and the Labour Party.